1. Preheat the grill to high. Cut the lamb into chunks, about 2cm, removing the bone and visible fat. 2. To make the pesto, whizz the mint, lemon zest and juice, olive oil and garlic in a food processor. Mix half the mint pesto with the lamb, cover and set aside. 3. Chop the peppers, onions and courgette into pieces, about 2cm. Skewer the lamb and veggies, coat lightly with olive oil spray and grill for 10-12 minutes, turning once. 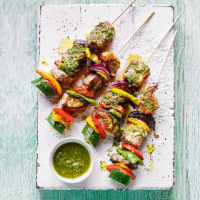 Remove from the grill and brush the remaining mint pesto over all the skewers before serving.